1 To make the syrup put the cider in a saucepan with the sugar, vinegar and lemon zest. Heat gently, stirring a little to help the sugar dissolve, then allow the mixture to simmer until the cider has reduced by just over half, to about 225ml. Remove the zest and leave to cool completely. It will become more syrupy as it cools. 2 If the curd cheese feels a bit ‘wet’ put it in a clean muslin-lined sieve set over a bowl and let it drain in the fridge for several hours. 3 Put all the ingredients for the pancakes, except the blackberries and oil, in a bowl and mix. Stir in the blackberries. Cover with clingfilm and put in the fridge until needed, but bring it out about 30 minutes before you want to cook it. 4 Heat a little oil in a large frying pan and spoon batter into it to form pancakes about 7cm in diameter (you should be able to cook 4 pancakes at once). Cook, over a medium-low heat (you will have to keep adjusting it), for 3-4 minutes on each side. You should be able to see when you can turn each pancake over – the batter will look set, there will be bubbles all over the surface and the underside will be golden. Wipe out the pan with kitchen paper and add a little more oil for each batch and continue cooking to make 12 pancakes. 5 As you cook the pancakes put each batch in a low oven to keep warm. 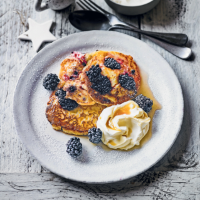 Serve 2 per person with some soured cream or crème fraîche, a drizzle of the syrup, a few blackberries and a little icing sugar sifted over the top. This recipe was first published in Thu Dec 21 11:02:00 GMT 2017.